Make sure your station is operating correctly. Monitor the station’s broadcast in your vehicle. 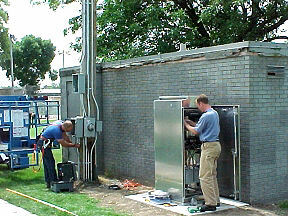 Determine that the range of your radio station continues to be what it was when installed. Take care to monitor the station on the same radio in the same vehicle at the same physical locations to make that judgment, since radio sensitivity, signal coverage and vehicle interference levels vary widely. If these areas shift closer to the station, continue with the checks listed below. Quantify your station's signal levels by documenting them with a SMR Receiver (provided with modern stations) at specific receiving locations. If the signal level value changes significantly on the receiver, then you know that your signal level output has changed. (Note: A SMR Receiver is available as an accessory item. See details here. NOTE: Due to their relatively low power, Information Radio Stations can be disproportionately affected by nighttime skywave interference, present after dark on some frequencies. Such stations will appear to have much lower range at night. See Skywave TechTalk article. How does the audio sound? Pay attention to the messages themselves. How's the modulation (or level of the audio) in the broadcast? If your message is faint, soft or difficult to hear even when you are within a mile of the antenna, the transmitter’s audio input may need some adjusting upward. If it sounds loud but distorted, the audio level may need adjustment downward. Adjusting modulation: Adjust the control on the right side, labeled "Audio/Audio Level." The associated LEDs, once adjusted, should show the audio level peaking in the yellow and occasionally red. Check the wattmeter to determine the health of your transmitter and antenna. On the wattmeter, forward power should be recorded and should be 10 times the reflected power on the meter. Call 616.772.2300 or email us for assistance in taking the meter readings. See more about the wattmeter here. If your station has batteries, test each battery individually with a volt-ohm meter set to measure DC voltage. Your batteries had standing voltages of about 12.8 volts when new. If healthy, they will show a charge greater than 12 volts when tested. Replace promptly batteries that do not meet this test, or system operation and message integrity might be compromised. Is there physical damage to the system or lightning damage to the antenna and other external components? Look for dark marks or other obvious damage or blown fuses, cables or wires that might have become damaged, loose or corroded at connection points. License renewal. Do you know when your FCC license expires? We can help you determine the expiration date. Do you know when your FCC license expires? We can help you determine the expiration date.